Sold from January 2009 to April 2010 exclusively by Big Lots, the recalled futon bunk beds are model number BFB1008. 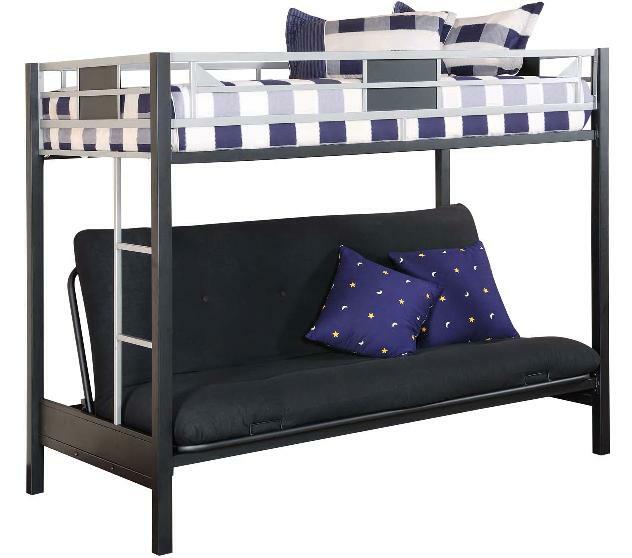 Big Lots has recalled approximately 30,000 metal futon bunk beds, according to the Consumer Product Safety Commission (CPSC). The beds are an entrapment hazard because children behind the futon or in the ladder area of the bunk can become trapped when the metal frame with the futon cushion on it are lowered to a flat, sleeping position. An additional problem with the futon bunk beds is that the space between the bottom rung of the ladder and the mattress is too small; it allows a child’s body to pass through but not their head and neck, which is an additional way for a child to accidentally get trapped and seriously injured or killed. A three-year-old boy from Burlington, Iowa, died when his head and neck were trapped in the bunk bed in March 2010. The weight of the metal frame prevented the youngster from escaping and caused his death. Sold from January 2009 to April 2010 exclusively by Big Lots stores nationwide for about $200, the recalled futon bunk beds are model number BFB1008. The model number is located on a label on the upper bunk support rail. The beds were manufactured in China and required assembly. If you have one of these bunk beds, stop using it immediately. Contact Big Lots for a free repair kit that contains new ladders and other parts which you can install at home. If your child has been seriously injured or killed due to a defective futon bunk bed or other defective furniture item, you need to email the attorneys at Carr & Carr or call1-877-392-4878 to speak with an attorney now. Make notes about how the injury occurred. The more information you can give us, the better able we are to help you. Keep the product that you believe caused your injury. If a lawsuit is brought against a manufacturer or distributor or others, it is necessary to prove that the product caused the injury. The product is needed to help prove it was dangerous and how it caused the injury. An injury alone does not prove that a product was defective. Store the product in a safe place until your claim is resolved. If you do not have anywhere to keep the product, your attorney can probably help you find someplace. If you do not have the product, contact Carr & Carr Attorneys because we may be able to acquire a similar product for you. The sooner you talk with us, the sooner we may be able to help you. This is especially true if a product was recently recalled. Our offices are in Tulsa, Oklahoma City and Springdale in Northwest Arkansas, but our personal injury attorneys are available to help you no matter where you live. We help families across the U.S. who have been hurt by defective products such as futon bunk beds, furniture that tips over, defective cribs and other dangerous items that children come in contact with.